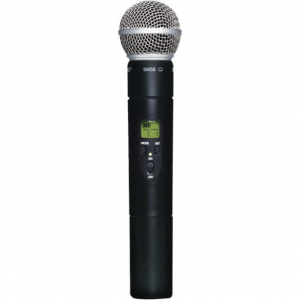 The Shure SM58 with ULX2 Wireless Handheld Transmitter (Channel 38) Handheld Wireless Transmitter is a ULX2 Wireless Handheld Microphone Transmitter with an SM58 Cartridge, Assembly and Grille. Go Wireless with the legendary Shure SM58 vocal microphone, tuned to accentuate the warmth and clarity of lead and back-up vocals. Consistently the first choice of performers everywhere.